If you've watched the Oi Rio Pro the last two nights, you, like many people, may have been surprised by the quality of the waves. The Lemoore wave pool is a hard act to follow for any location, but for Brazil - more known for its bumpy beachbreaks - the feeling was it would be a big let-down. Which is why the last two days of competition have been so exciting - it just wasn't expected. If you haven't watched any of the contest but want an example of the quality then visit the highlights reel for Round 2, Heat 10, Joan Duru vs Sebastian Zietz, and marvel at Saquarema punching well above its weight. The other surprise is which end of the beach the contest is being held. Both days have been run at Barrinha, which lies at the western end of the beach. Saquarema has hosted international contests since the 1990s, first on the Qualifying Series, and then in 2002 it featured as a CT for the first time - the Mundial Coca-Cola de Surf, won by Taj Burrow. After the Mundial it went back to a QS event until last year when it stood in for Rio de Janeiro owing to Rio's pollution problems. 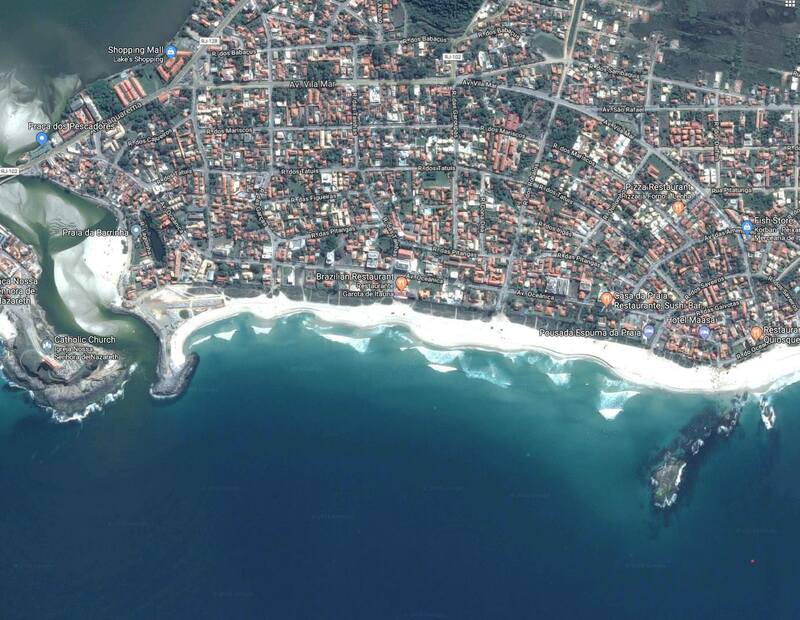 The thing is, in almost all instances the contest has been held at Itauna, at the eastern end of the beach. Itauna has a natural rock outcrop around which sand gathers creating a long, semi-pointbreak lefthander. As the sand stacks in a triangular shape against the rocks, Itauna can also hold a fair amount of swell. Traditionally it could hold much more size than Barrinha, as the latter was straight and closed out over a few feet. However, Barrinha has been the beneficiary of a bit of coastal engineering, and the result is a bloody good wave. Like a lot of coastal engineering here in Australia, the surfing amenity wasn't considered though the waves were improved by the construction works. 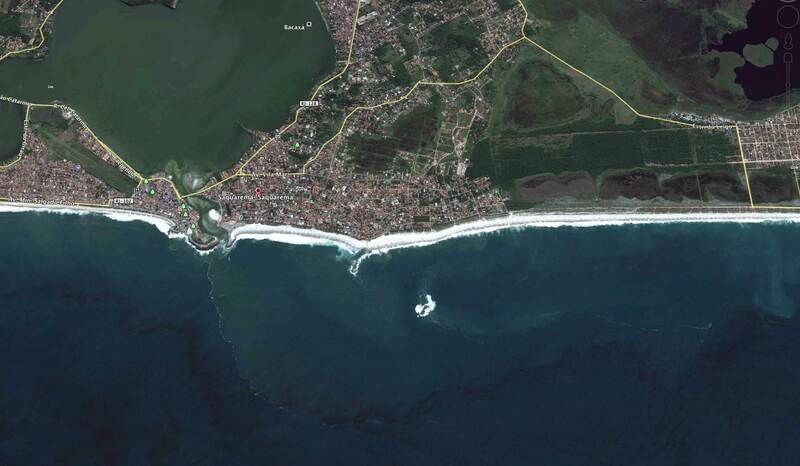 Behind Saquarema lies a series of lagoons stretching 12 kms long, and 4 kms across at the widest point. It's a substantial waterway yet it has just one narrow access point to the ocean. The entrance is at Barrinha, and the pinched entrance meant it often silted over. The entire northern shore of Saquarema Lagoon is farmland and with fertiliser run off and a lack of regular flushing the waterway was prone to algae blooms - what scientists call hypertrophication. Around the turn of the century the first steps were taken to fix the problem. Initially, a short breakwater was built at Barrinha, though the entrance still silted over. See the image below taken in 2002. Three years later the breakwater was altered to resemble a 'T', which narrowed the channel - forcing the water to flow faster - but also putting the kybosh on any chance of a wedge forming on the beach side. For a decade the breakwater was left in this shape. See image below from 2012. Much like the lower NSW coast - say from Forster south - Brazil's coast has many long beaches abutted by the ocean on one side and estuaries on the other. With urban sprawl and unregulated agriculture, those estuaries have become polluted. Exhibit A is Tijuca Lagoon that empties its tainted load near the coast at Arpoador and caused the Rio Pro to be moved from Rio. 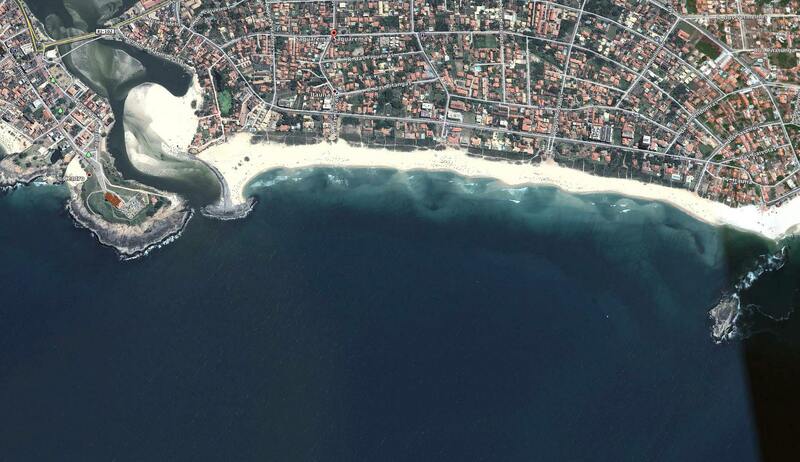 Saquarema also has pollution problems, mostly fertiliser run off, so in 2014 the breakwall was reshaped to force the entrance away from the beach. 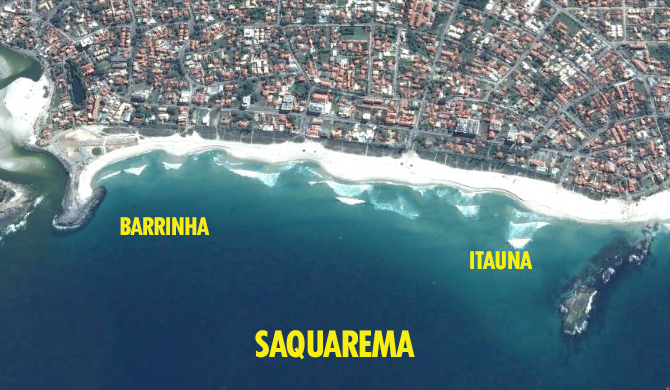 The longshore drift at Saquarema is west to east, but by orienting the ocean entrance to the southwest the pollution bypassed Saquarema. Note the polution slick in the image below, which was taken in 2016, and how it flows out to sea before moving parellel to the coast. Zooming back down to low altitude, you can see the breakwall was extended, the top of the 'T' taken off, and the breakwater itself was widened to resemble a natural headland. The photo below was taken not long after the new construction works began in 2015. 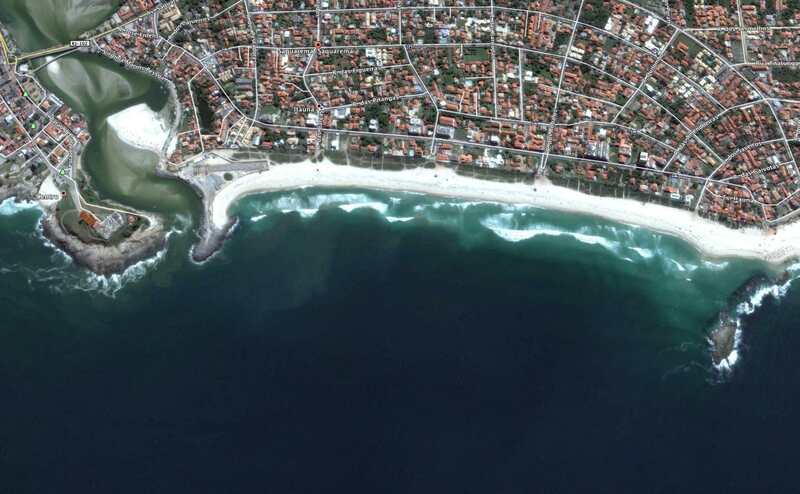 Most importantly, at least for surfers, was that the eastern side of the breakwall was aligned to follow the predominant swell direction at Saquarema. No longer an unsurfable 'T' shape, it mimiced a natural pointbreak with sand stacking up against it in a near identical reflection to what happens at the other end of the beach. 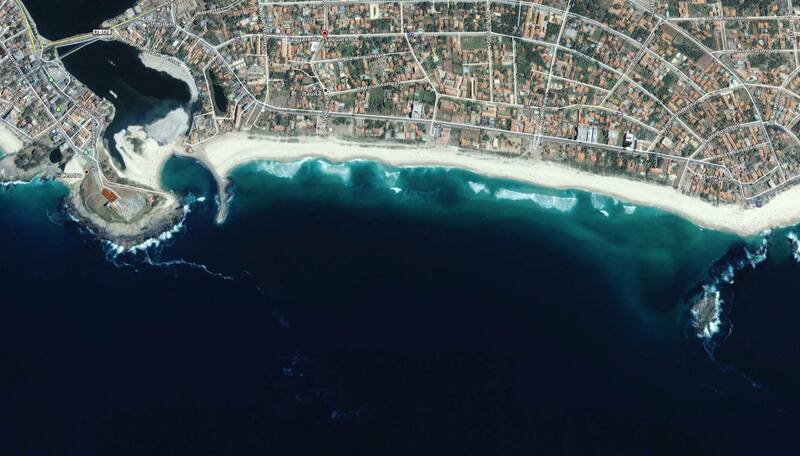 The following photo was taken a year after the new breakwater was completed and shows Saquarema during a small swell. It's hard to ignore the scalloped shoreline along the length of the beach and wonder if this is a byproduct of the breakwater. When sand gathers around a headland it needs an adjacent channel to flow back out to sea, a pattern that can be repeated along the beachfront. By augmenting a natural feature, Barrinha has become a legitimately good wave and this highlights an important point. That being, surfers should always stay involved in coastal engineering as the work at Saquarema could easily have gone another direction and been of no benefit to surfers. It's also possible to make the point that enhancements in a natural setting are more captivating than a man made pond, but I'll leave that to others. Jeremy Flores's tube last night was a smoker too. Yeah couldn't believe it was Brazil. Clean as a whistle, barrelling and with real oomph. I have been glued to the screen which is the opposite to the floater gate of old. Couldn't help but laugh watching everyone surfing off a break wall on the first day at the right. It didn't look like much was happening on the left. Not sure what was happening but on the first day of competition. You could actually hear the commentary team talking off line they were commenting on the conditions and lack of swell and banks at the left . pretty interesting really. Stu do you know how the fantasy contest plays out now with the margarets /ulus change or has it finished and moved on from that? Nah, not sure but I think it just carries on from Margs to Ulus - i.e you dont get to choose again. yeah great report Stu, been hoping the commentators would go into a bit more detail of what went on with the engineering. They have created a very good wave. Was this just a byproduct or did surfers actually get involved in the alignment?. Also whats the history of that large house/castle on top of the hill imagine the view!. The church? That's the Igreja Nossa Senhora de Nazaré'- Sanctuary of Our Lady of Nazaré. Local worshipping palace that shares its name with a wave in Portugal and a village in Israel. "In 1630, attracted by a mysterious light, a fisherman checking nets found a statue of the Virgin and Child along the seacliff near Saquarema, on Brazil's southern coast." All this has got me thinking about Slater and Sebastian Inlet. The wave he trained on, applied himself to, and which arguably created more champion surfers then any other wave on the planet, hasn't broken for ten years. In 2005 engineers tweaked the footings and beach contour, and overnight Sebastian Inlet stopped being a wave. In this article, Slater said he'd "do anything" to get Sebastian back, though you'd think correcting a rockwall wedge would be a far easier and cheaper proposition than building a wave pool from scratch. Wonder if he'll ever have a go at augmenting nature? Starting with the wave he grew up on. I earlier mentioned how free of manhandling the Brazilian coastline appears. Saquarema wall is like a girlie hopscotch game buying D' Deen Bros an extra hour's Smoko . East Coast OZ lads 'd be saying . "That's not a Breakwall...Here! Lend us yer Bulldozer!" Truth of the matter is it kicks arse & set to go off from Sunday night onward. Kaboom! I had a go at a natural break wall wedge today, damm those things are fun. Yeah i have been surprised they have had to pick them, but there has been some good waves, actually looks like a good set up. While I don't disagree with the idea of surfers being involved with engineering and designing things to produce surf, I have to question the attribution of the scalloped shoreline along the length of the beach to the breakwater modification. Perhaps you could argue some effect related to edge wave enhancement if you subscribe to such theories, although can't see how the modifications mentioned would do this (the existing structure would already provide a good boundary reflector). The last image simply looks like a classic transverse bar and rip beach state (and not unlike the first image from 2002) typical of an intermediate beach type which tend to be variable with time depending on the wave conditions. I would say Snapper Rocks / superbank with all its man-made sand deposition is far more artificial than Barrinha. Nothing wrong with this though (aside Kirra impacts). Trancoso is bang on... in oh so many ways. 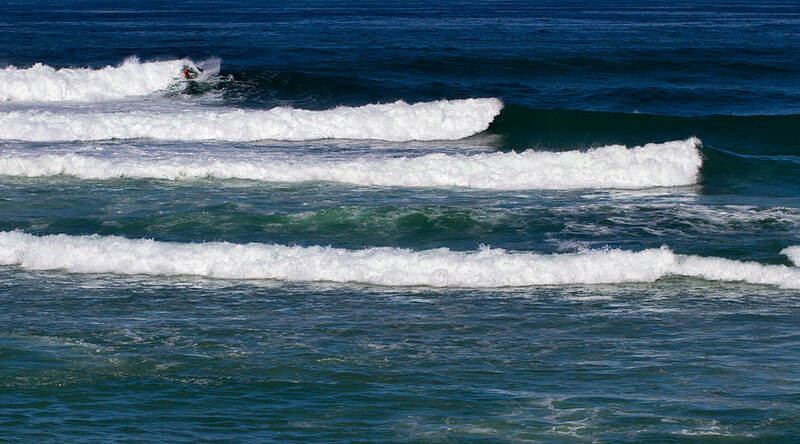 WSL athlete's rep participates in re-contouring Superbank playing surface leading into event. 'Just Leveling the playing surface Guys!'... Canny local Rep cracks secret Formula! Pumps out a Special Tour Brew! Circus leaves & monks'n'mortals back to begging for slops. At Barrinha, i saw an early heat and noticed one of the local Brazos paddling out super close to the estuary breakwall - because, clearly that was where the rip was taking him back out to sea. Extending on from your discussion, the hypothesis would be - put breakwalls at acute angle to the shoreline - to control the location of rips - which in turn controls the location of banks - to get longer peeling waves. The breakwall at Evans Head is a good example of this phenomenom, the current runs north to south along the shoreline gutter, then west to east along the deep gutter beside the angled breakwall. Makes for an effortless paddle out. There is therefore always a lefthander that peels along the shallower sand build up beside the deeper breakwall gutter. The quality of this wave is only fair to average. Years ago I came up with a system that rates the best places on our coastline to build surfing reefs. This particular place rates as the best place on the North Coast to build an "A'' frame surfing reef. The angle of the breakwall is just one of the many positive reasons. "pollution slick" what a term for the modern day. Wonder what else they chuck into the ol lagoon dump. The Mornington Peninsula could do with some manhandling. I'll try & link a really cool missing photo of this natural pointbreak. Photo shows morning high water mark & afternoon high tide. Note the high water mark falls just shy of flooding the lagoon. I seems the Lagoon got flushed on spring/king tides/tidal surges. Good zoom anyone? Possibly see dozers/trucks wasting efforts...stock piling sand. You guys can best wire -up the point break. 1st glance says it fires on Big swell @ hightide or works free of beachie on mid tide. Stu! Get your tech guys to add this epic Saquarema Pointbreak photo to complete gallery. Whut. I'm no coastal scientist, but in my, let's call it experience, it's safe to assume a not insignificant portion of the sediment building up at the entrance there is coming from upstream. Building a groin aint going to stop that sediment flow. It MAY accelerate the stream velocity in that location because it provides less erosive services (moving material takes energy out of the flow, but some nice rockwalls can help it maintain velocity). Emphasis on MAY, because in the final two images you can see the build up of sediments again at the entrance. As for the latest at greatest version they've got going - two things are worth pointing out IMO. The first is how you claim it's current/latest orientation is saving the day. But it's orientation today looks pretty not that dissimilar to the original orientation shown in the 2002 image. Secondly, take a look at the distribution of sand across the adjacent beach, in particular left of the rock formation at the Itauna end. Note the build up of sand in the final two images (I'm assuming they're 2015 and 2017?). BUT, also note the very big reduction in sand at the Barrinha end, especially in the corner. This is likely because the wall is playing a role in reducing the sediment supply. So the sand at the Itauna end has come from the Barrinha end (and maybe some gets moved inshore from longshore drift). BUT WHO'S FEEDING BARRINHA? It's probably the fact that sediment came out of the waterway, with some being trapped as a slug at the rocky outcrop. This slug would slowly migrate around into the Barrinha stretch. Or/and, by channeling the current exiting the waterway away from the beach (and possibly strengthening it), the current disturbs the longshore west-to-east transport of sediment (i.e. it nudges it out further from the shore), meaning less could be getting deposited on that stretch of beach. If in the not-too-distant future, if the beach at Barrinha is even narrower and even Itauna is starting to look slim, then we'll know I'm probably right and I can send an invoice to whomever the local government there is. The lagoon itself would be a trap for any sediment washing off from the catchment. From the aerial pic you can see the sand delta at the upstream end of the entrance channel and entering the lake which indicates the sand is marine and is getting washed in from the ocean into the entrance and then the lake by incoming tides. Nice thing to wake up to. Thanks for the heads up Shoredump. Be cool if someone could date photo ... (Mid 1960's ?) As there is a hi-rise cluster in the city. I'm chasing a Brasileiro mate for some further info on that.